Because Active Directory plays a critical role in the management of user authentication and access rights, it is number one in compliance auditors’ checklists. All security compliance standards require organizations to establish and maintain continuous tracking of Active Directory changes and regularly assess its current or past configurations. However, with only native auditing tools to help, achieving and sustaining Active Directory compliance is neither easy nor cost-effective. In fact, given the large number of changes that happen every day in Active Directory, especially in large environments, it’s nearly impossible today to adhere to compliance requirements without a dedicated piece of software for compliance audit reporting. Netwrix Auditor for Active Directory helps organizations achieve and maintain Active Directory compliance by providing complete visibility into Active Directory changes and configurations. This helps you constantly validate that certain control processes, such as access controls or account management controls, are in place and effective. Real-time alerts enhance IT compliance management further by keeping you informed immediately about critical Active Directory changes that violate security and compliance requirements. Moreover, Netwrix Auditor for Active Directory provides the actionable audit data required to prove that your organization’s information security program adheres to PCI DSS, SOX, HIPAA, GLBA and FISMA compliance regulations or other standards. Out-of-the-box Active Directory reports mapped to specific compliance standards greatly simplify providing the required proof to your auditors. You can also automate the entire compliance reporting process by subscribing key stakeholders responsible for managing compliance programs to the reports they need. If auditors have specific questions that aren’t adequately addressed by any predefined report, you can quickly find the answers using the interactive search feature. You can also use this feature to dig into any suspicious activity that might incur compliance risk so you can identify the source of the threat and quickly lock down the system. Regulatory standards also require organizations to retain Active Directory audit records for later reviews. Unlike other compliance solutions, Netwrix Auditor provides two-tiered storage that enables you to keep your audit trail for any period of time and ensure easy access to it for historical reporting, without increasing storage costs. 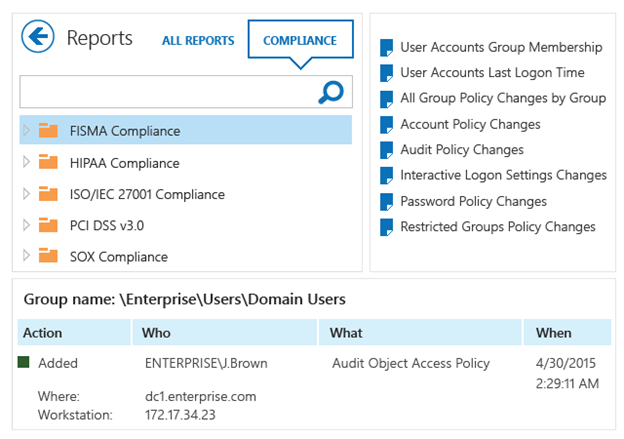 In short, Netwrix Auditor for Active Directory can help your organization streamline its compliance efforts and prove to internal and external auditors that IT controls supporting your security policy and fulfilling the requirements of applicable regulations are — and have always been — in place.